I read the following recently and thought it was a timely reminder to stop and take care of the many moments that come our way. I shared this with the Sunday School teachers also, reminding them that there are 'moments' that occur in our classes when we may need to divert from the lesson plan in order to actually minister to those in our care. 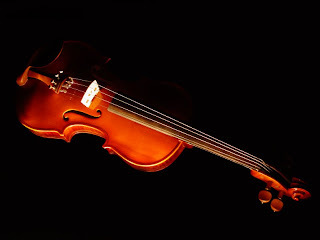 On the very cold morning of January 12, 2007, a man sat at a metro station in Washington DC and started to play the violin. He played six Bach pieces for about 45 minutes. During that time, since it was rush hour, it was calculated that thousands of people went through the station, most of them on their way to work. Three minutes went by and a middle aged man noticed there was a musician playing. He slowed his pace and stopped for a few seconds and then hurried up to meet his schedule. A minute later, the violinist received his first dollar tip: a woman threw the money in the till and, without stopping, continued to walk. A few minutes later, someone leaned against the wall to listen to him, but the man looked at his watch and started to walk again. Clearly he was late for work. The one who paid the most attention was a 3 year old boy. His mother tugged him along, in such a hurry, but the kid kept stopping to look at the violinist. Finally the mother pushed hard and the child began to walk turning his head all the time. This action was repeated by several other children. All the parents, without exception, forced them to move on. No one knew that the violinist was Joshua Bell, one of the best musicians in the entire world. He played one of the most intricate pieces ever written with a violin worth 3.5 million dollars. This is a real story. Joshua Bell playing incognito in the metro station was organized by the Washington Post as part of a social experiment about perception and priorities of people. They wondered if humanity intricately perceives beauty or if it is something dictated to them by peers and media. They wondered if calendars and clocks were more important to thousands of people than what has been defined as some of the best music in the world. They wondered if people are so caught up in their own preoccupations, their problems and pursuits that they don’t even know when they step into the sphere of the uncommon. Gene Weingarten of the Washington Post initiated the experiment and the article describing the event won him a Pulitzer Prize. But even more impacting than the Pulitzer Prize, is the question that is still resonating from the whole ordeal. Weingarten asks us all: If we do not have a moment to stop and listen to one of the best musicians in the world playing the best music ever written, how many other things are we missing? We read in the Gospels about others who missed some very important moments. · A priest and a rabbi missed a wounded man on the side of the road who was dying. A Samaritan—viewed as second class—was the only one who noticed. · An innkeeper missed the moment in Bethlehem when he turned away an exhausted man and a woman in labor on a donkey. · A rich, young ruler came close – SO very close – to recognizing the magnitude of the dusty Rabbi. But in the end, his money proved too enticing…and he gave up earthly fulfillment and eternal riches to hang on to what was familiar to him. · The Pharisees and Saducees studied about Him day and night. They prayed, they expounded, they represented Him 24/7…and when He walked into their temple, they had no clue who He was. I’ve missed some moments in my life. Some I know about, but I wonder how many I will never know about? How many angels have I entertained, unaware of who they were? How many needs have I not seen, nor heard, because I was in such a hurry? How many times have I bypassed the widows and fatherless--what the Bible declares as pure religion—simply because I had a deadline to meet, or a plane to catch, or a list to check off? The lesson of Joshua Bell and the violin in the subway station has gripped me.